BUFFALO, NY (01/07/2015)-- New York Air National Guard Col. Kevin Rogers marked the 215th birthday of President Millard Fillmore by laying a wreath from President Barack Obama at the grave of the 13th President on Wednesday, Jan. 7. The tribute from the 107th Airlift Wing Inspector General, was part of the 50th graveside ceremony marking Fillmore’s birth conducted at Forest Lawn Cemetery by the University of Buffalo. Fillmore, who was president from 1850 to 1853, was one of the founders of the University of Buffalo. He was also the school’s first Chancellor and instrumental in founding Buffalo’s General Hospital and local libraries and museums. The University of Buffalo has hosted a graveside ceremony for Fillmore for the past 50 years. The ceremony also encompasses another tradition: the presentation of wreaths form the current president at the gravesites of past presidents on their Birthday. 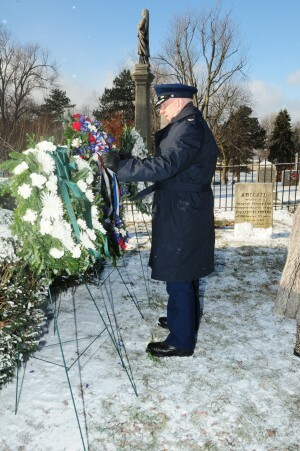 The 107th Airlift Wing, based at Niagara Falls Air Reserve Station, traditionally places a wreath on Fillmore’s Grave. The New York National Guard also places wreaths on the graves of President Martin Van Buren in Kinderhook and President Chester Arthur in Albany. Fillmore was born in 1800 in Moravia New York. He was a lawyer and served in the New York State Assembly. He served in the United States Congress from 1833 to 1835 and again from 1837 to 1845. Fillmore ran unsuccessfully for governor of New York in 1844 but was defeated. He ran successfully for the position of State Comptroller in 1847 and was the first person to serve in that office as the state’s financial watchdog. In 1848 Fillmore was nominated to run as vice president with the popular General Zachery Taylor, a hero of the Mexican War. Taylor died suddenly and Fillmore became president. He approved the bills that put in place the Compromise of 1850 designed to allow Texas to enter the Union as a Slave State in exchange for California entering it as a Free State. The measure also banned the sale of slaves in the District of Columbia. Fillmore, the last member of the Whig Party to serve as president, returned home to Buffalo after losing the election of 1852. During the Civil War Fillmore, a former Major in the New York Militia, commanded a Buffalo home guard regiment called the Union Corps. He died in 1874. The New York Air National Guard’s 107th Airlift Wing shares Niagara Falls Air Reserve Station with the Air Force Reserve’s 914th Airlift Wing. The unit is currently in the process of transitioning to a mission flying remotely piloted MQ-9 aircraft after previously flying the C-130 transport aircraft and the KC-135 refueling plane. Members of the 107th Airlift Wing also respond to New York state emergencies and were heavily involved in responding to the lake effect snowstorm which hit Erie County in November.